M for Montreal is returning to Austin for SXSW again, this time for a showcase at both floors of Maggie Mae’s on Thursday, March 13. 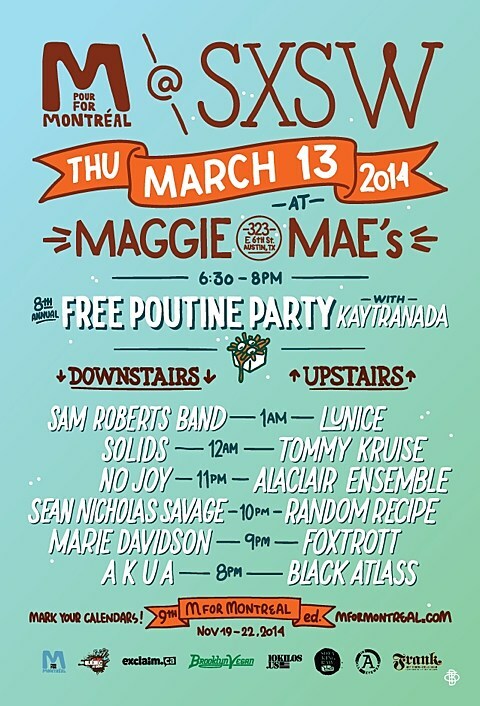 It starts with a free poutine party from 6:30-8 PM with a set from Kaytranada. Then at 8, there’s music upstairs and downstairs from AKUA, Black Atlass, Marie Davidson, Foxtrott, Sean Nicholas Savage, Random Recipe, No Joy, Alaclair Ensemble, Solids, Tommy Kruise, Sam Roberts Band and Lunice. We at BrooklynVegan are also proud to be one of the media sponsors for the event. That’s the flyer with set times above.